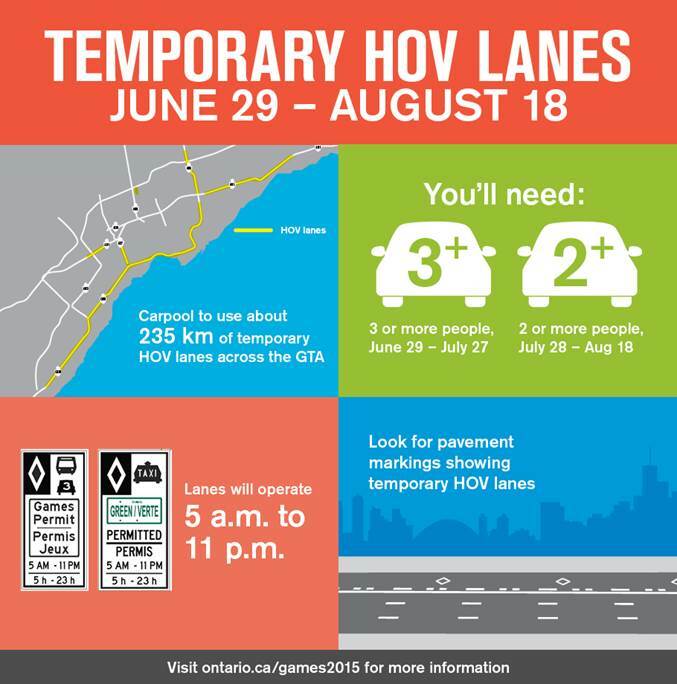 It’s been a week of temporary High Occupancy Vehicle (HOV) lanes in our fair city, in anticipation of the Pan Am Games. Any look at your social media page of choice will show that this is not without some controversy. I could repeat some of the more colourful comments, but this is a G-rated blog. We tested out the lanes this weekend to visit some family and absolutely loved breezing by (4 in the car, unlike this guy). Municipal Roads with HOV lanes: Don Valley Parkway, Gardiner Expressway, Lake Shore Boulevard, Jane St.
For those steaming and stewing about not getting access to the fast lane, there’s an easy solution that helps us all … share your ride with 2 buddies so they leave their 2 cars at home. If 30 people do this, 30 cars turn into a measly 10. Thinking bigger: if 30,000 do this we get down to 10,000 cars … way less traffic no matter what lane you’re in. What a way to help Toronto’s famous congestion problems! Or gripe about it, ignore the signs and sneak in … enjoy the $110 fine and three demerit points. We witnessed police out in numbers, pulling over several single drivers (like the irate guy in the convertible) for that offence. Misery, in this case, really would have loved company. Because we like the carrot better than the stick, there’s some nice rewards for doing the right thing. Get yourself commuting sustainably (lots of ideas here) and you can play the Commute To Win Game! Log your sustainable trip during the Games for your chance to score great prizes! Each trip log on the Smart Commute Online Tool enters you in a draw to win an iPad Mini or one of four $100 VISA giftcards! Starting today (July 6), the Ministry of Transportation will give the daily scoop on competition-related road closures, events and travel advice for every day of the Games. Info will be up and ready the evening before to help you plan your commute for the next day. Fresh daily here: ontario.ca/games2015. The 2015 Games Trip Planner is available for free on Android, Apple, and Blackberry and on web browsers at 2015gamestripplanner.ca. For those driving during the Games, whether spectators or residents, the 2015 Games Trip Planner provides real-time traffic and closures information. This entry was posted in Beyond Talkin' Trash and tagged HOV, panam, sustainable transportation. Bookmark the permalink.